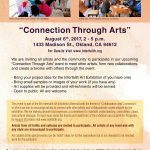 The Faith Trio, an interfaith alliance of Kehilla along with the Islamic Cultural Center of Northern California and Montclair Presbyterian Church, has sponsored three large interfaith art exhibitions in 2011, 2013 and 2015. Many Kehilla artists have participated in these exhibitions and many more people have enjoyed seeing the exhibitions. We are excited to announce that we have created a website documenting these exhibitions which can be viewed at www.interfaithart.org. er ofNorthern California. For more information please contact Lea Delson at (510) 528-6725 or lea@delsonphoto.com.